My friend and I went to a lovely Lebanese restaurant in White City Westfield. The place looked amazing with its Arabian decor and dark wood interior. The food was equally as amazing if a little pricier than the other restaurants in the area. 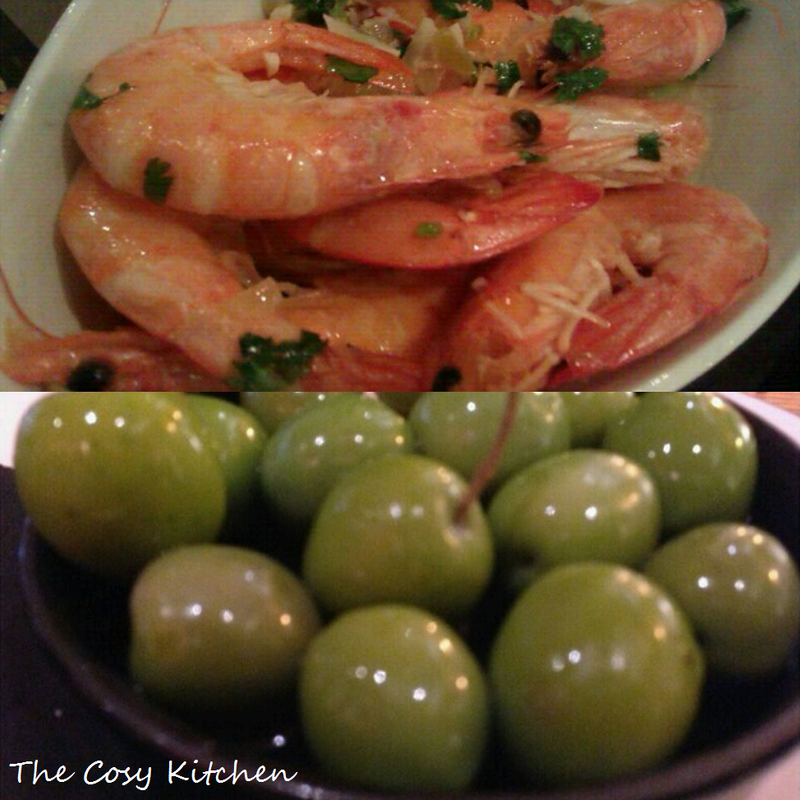 We ordered a bowl of olives and garlic prawns to share. My friend being a guy ordered the usual mixed grill that consisted of big chunks of chicken and lamb (Lamb, Shish Taouk and Kaftah) served with a side of chips. I decided to be a little more adventurous rather than play it safe. 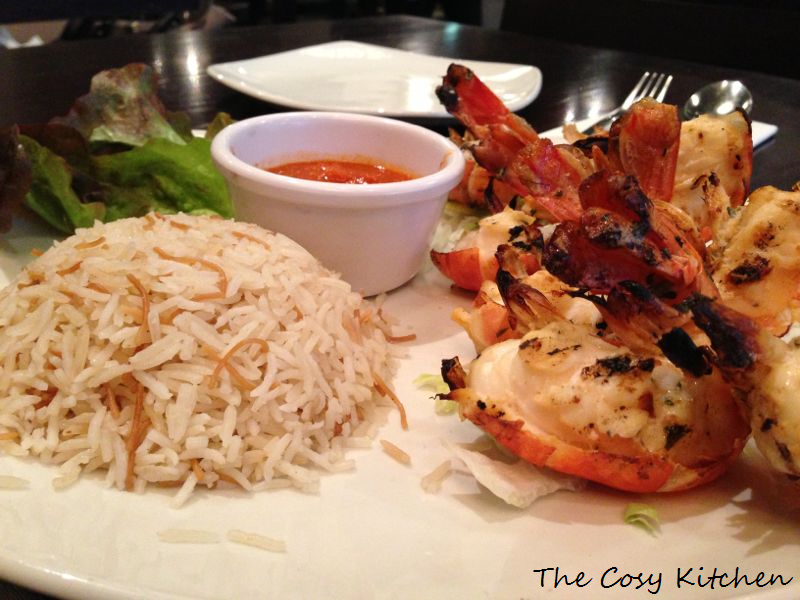 I ordered the King Prawns which consists of delicious grilled prawns marinated in olive oil, served with special chef sauce and Lebanese rice. 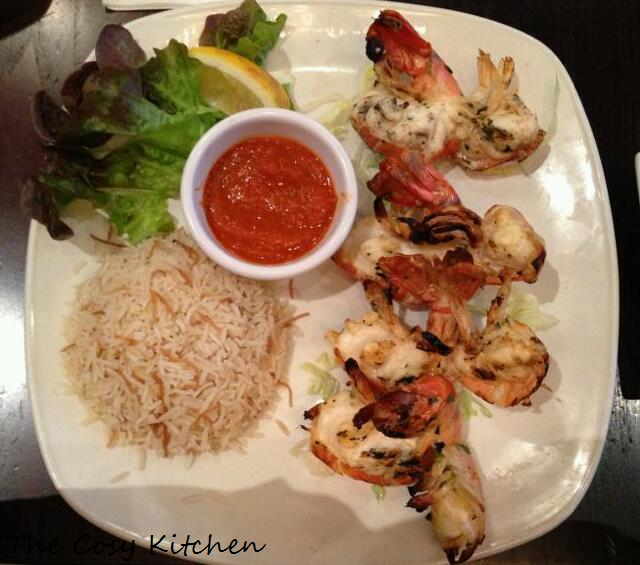 The presentation was beautiful and the prawns went very well with the tomato-y sauce and the rice. This looks delicious! I will have to visit one day! Pretty nice post. I simply stumbled upon your blog and wished to mention that I have truly enjoyed browsing your weblog posts. I shall try this place out, thanks. Your blog is making me drool! Hey! There’s a Mandaloun near where I live, too! Now I’m really craving some Lebanese/Mediterranean food. Yummy pictures, by the way! Thank you! Let me know what you like so next time I’m there I might try it out! ooo that sounds fun! The rice is really good, my mum makes it often! it looks soooo delicious! thanks for sharing! I may as well check things out. I like what I see so now i’m following you. Look forward to going over your web page yet again. I’m attempting to find things to enhance my website!I suppose its ok to use some of your ideas!! Mmm.. Looks amazing. I need to try Lebanese food! Thank you! You should! It is amazing!